These are all so beautiful, especially the basket cover! How appropriate for Easter bread or hot cross buns! How beautiful! I love the basket cover, too! These are so beautiful! They would be a beautiful addition to any Easter table or Holiday basket. How beautiful! I didn't know you had more than aprons. The basket cover would look beautiful over our Easter food basket for Holy Saturday. Love the aprons but I think the Lamb of God table runner is my absolute fave. That may need to make an appearance on my Easter table! The basket cover is beautiful! Love the Eastern design! How great! It's gorgeous :). Yes please add my name to the drawing, thanks! This is gorgeous, as are all your products! I love serving my rolls or sliced bread in a basket lined with a beautiful linen. I have often thought about trying my hand at making my own...just not that talented! Thank you for the chance @ one of your products! I love the Khaki apron with the brown cross and Ad Majorem Dei Gloriam. I would love to win that basket cover. Love the table runner and the basket cover. The table runner is beautiful. I would want to use it every day and not just Easter. What a great idea to use to cover a piano. Love the table runner & the Mary apron! And the basket liner of course :o) Such cool products for our Catholic homes! Please enter me in the drawing. Thanks! Such incredibly beautiful offerings! Thanks for the give-away and thanks for providing such an excellent resource for our Catholic families as we celebrate our rich liturgical year! Beautiful and useful. I bet Father would even have a use for this at church! 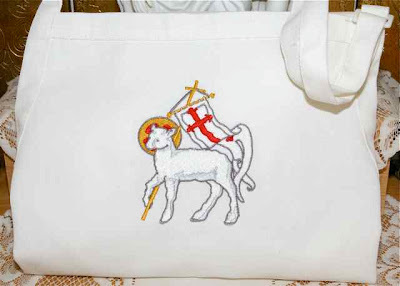 So beautiful - I love the Lamb of God apron... that symbol has a special meaning for me. I love the Agnus Dei table runner and the Ora et Labora apron. So many beautiful items! Beautiful items! 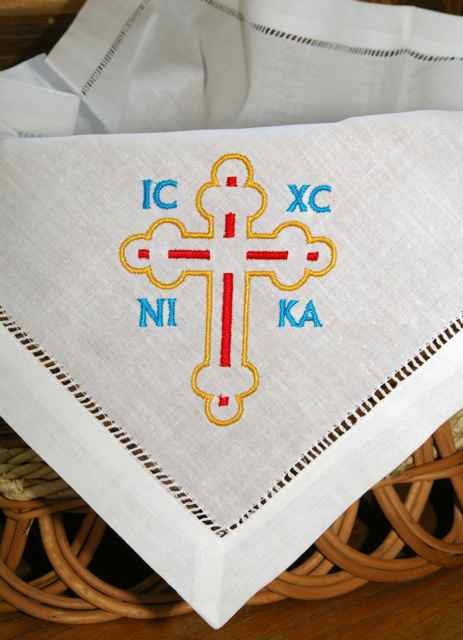 The table runner is gorgeous and the St. Frances of Rome and St. Stanislaus aprons are some of my favorite quotes. Thank you so much for providing a fun and faithful resource to celebrate the Liturgical Year with my family! What a beautiful basket cover! Perfect for Easter!! I like the new table runner ... and all of the aprons are beautiful! Thanks for the chance to win! Wow! What a beautiful way to bring the liturgical right to your kitchen! Thanks for sponsoring the giveaway. So, so beautiful! Thanks for all of your wonderful ideas. You have blessed our family's celebrations so many times in the past year. So glad to have found you! So simple and beautiful - the new table runner and basket cover reflect the Easter season's celebration of the Lamb of God. I wish we could use these in the Atrium of the Catechesis of the Good Shepherd in our school. I don't think I can make a choice as to which apron is my favorite! Wondering if you would have any scraps of material to make miniature purificators and corporals for our atrium? All the aprons are so beautiful! I'm a new follower of your great Catholic food blog ~ thanks for all the wonderful information to keep us connected to the Liturgical Year. For years I've enjoyed an old, out-of-print cookbook called "Cooking With Christ", and this blog of yours complements that very nicely. I'd sure love that gorgeous new give-away, although I don't think I'd have the heart to let it get soiled by actually using it for food! Beautiful! Just finished listening to a CD from Lighthouse Catholic Media about the Lamb's Supper, so this was a surprising (God is hilarious!) e-mail about the giveaway. Can't wait for Easter - maybe this year I can get an awesome apron in MY Easter basket! What gorgeous items! Thank you for offering a drawing for one of them! These aprons would be great for a Catholic School lunch lady (ours is my mother in law!) I think I'll have to get one for her soon! What beautiful new items! I have some delicious Easter rolls for a pretty basket liner like that! The new items are beautiful. I love the table runner and the basket liner too. Thank you for the giveaway. adriennecorvetteamerica@yahoo.com. This is a great idea for Eastern Catholics too! I love the table runner! What a pretty collection. May the humble St Joseph intercede for me! and fruitful lent to all! Thank you for the opportunity. Really beautiful! I love the Little Way apron...that is so cute. And the pysanky basket cover is perfect for Easter which reminds me we need to get "cracking" on our pysanky for the year! :) Thanks for the giveaway opportunity. :) Blessings! I like all of them, but really love the "do all things with love" apron - so beautiful! I love the basket cover! Oh,oh! Our bread basket linen was recently recently ruined, so this would be great! Spaceeba! Everything is just Beautiful! We would love to grace our table with the basket and linen. How beautiful! Thank you for the giveaway. I love the bread basket and beautifully embroidered linen. A bread basket has been on my wishlist for awhile! I love making psanky and I would love to surprise my husband with this basket cover when we go to get our psanky blessed on Holy Saturday. All of the embroidery is so detailed... beautiful. Would love to have any one of these items. The basket liner is wonderful! If I don't win it, I may have to drop serious hints for a Mother's Day gift! I am always looking for something to line my baskets with when I share items at lunches for teachers or pot lucks. This would be the perfect item to share my faith with others! Now about those wonderful aprons! After ruining several shirts, I have recently become an apron wearer. Mother's Day is right around the corner and maybe tis the season, but I love the Celtic Cross on the Kelly Green! Beautiful products as always! Thank you for the chance to win! The cover is lovely! It would look very pretty on my Easter table. I love the brown St. Stanislaus apron. The basket liner is beautiful! I am very impressed with the recipes that you have for all occasion and the aprons look very unique and beautiful. I have only recently found your blog and I love it. Your products are simply beautiful. I love the recipes and information. Love all of these new products! So happy to have so many resources for feast days through your blog!! Thanks! Happy feast of St. Joseph! I love the table runner!!! So beautiful! Thank you for giving us the chance to win the cover/liner. All of the options are wonderful! And reasonably priced, too. Thanks for the giveaway! Hi Jessica, there are so many pretty ones to choose from but the ones that immediately caught my eye are the Celtic Cross and Ave Maria aprons. The basket liner/cover is just beautiful! It would be a lovely addition to any special gathering. Please enter me in your giveaway. All of the embroidery items are beautiful...I think I already have a Christmas "wish" pciked out! LOL! I hope this is where I enter the giveaway. Either way, I just want to thank you for this site. Your insight, sugestions, recipes, and inspiration to live the liturgical year are just wonderful and so greatly appreciated. Keep it up! So beautiful! Would love to have that lining the basket of food we bring to have blessed on Holy Saturday! This is a perfect excuse to head on over to Catholic Embroidery and look at aprons! Thank you for the wonderful work all of you do here! My email is rhymnathotmaildotcom. God bless you the rest of this Lenten Season and throughout Easter! All the aprons are fantastic, but I especially love the basket liner. Today on the feast of Saint Joseph, I was blessed to discover your website. Everything about the feast of Saint Joseph ( the recipes, the altar, customs & prayers) all endearing and so wonderful. I also really love the aprons, each insignia is our own pray each time one wears it. So good to use one's hands for the Lord in preparing any meal or desert for others. Of course I must mention the Easter items also. Since the passing of my Grandmother Anna, I have not been able to find anything with the Holy Lamb. I will definitely be spending lots of time on this site. My sincere thanks and appreciation for celebrating Catholicism and all the Holy Days and feast days!!! !